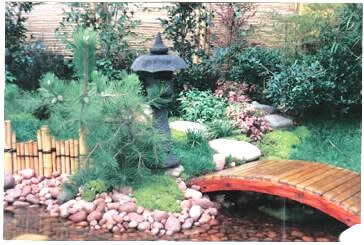 Oriental and Japanese garden design concepts were used by us to design and landscape a garden in the Lifestyle Garden Show. Our garden won a Gold medal and the sought after “WoW” Award from Elle Decoration Magazine. This design and pictures are available as a free garden design download later on this page. This Oriental garden is divided into 3 parts, the foreground, middle distance and background. The foreground contains level gravel. Similar gravel is used in front of the mansion. Raked gravel is used to represent the trials of life. When life goes smoothly, the gravel is raked in straight lines. When life is hard it is raked in waves. In general, the gravel is raked straight, but curved around rocks. The middle distance contains a pond with land jutting out from the sides. This helps increase the spaciousness. The rear of the pond contains focal points of dry waterfalls, bridge and an island of rocks. The background is an enclosing hill and trees that merge into the hills. This is borrowed scenery. Careful placement of rocks is symbolic of raging rapids. 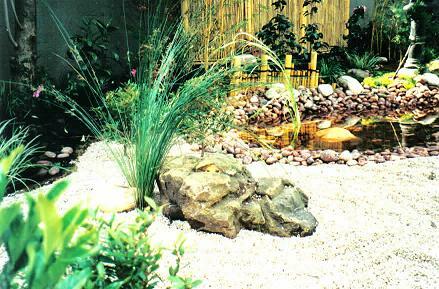 The secret for a successful Japanese garden design is to have something in the centre. The centre must never be open. Mandarin and cherry trees are suitable for a Japanese garden. Design one mandarin and one cherry tree into your concept. The cherry blossom is symbolic of the birth of spring, time is moving on and a change of seasons. The symbolism is also applicable to your life’s journey. Use lotus flowers in your water feature. Azaleas are famous in Oriental gardens. 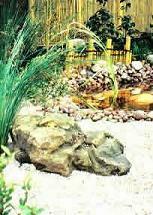 Sacred bamboo, clean cut with woody stems removed are essential for your garden design. This plant loves shade. Use borrowed scenery e.g. your neighbor’s tree, in your design to represent the required hills in the background. This Japanese garden has three distinct areas. The first is the wooden deck which integrates the garden with the home. It thus introduces the human aspect. It focuses on using natural materials such as wood and bamboo. A stone water basin is placed at the entrance. This allows visitors to cleanse their, hands, mouth and spirit. The dry stone garden symbolizes the ruggedness and strength of nature. The raked gravel represents the trials of life. The water in the pond reflects the natural landscape, symbolic of the spiritual reflections the visitor experiences. The whole garden is an imitation of nature on a much larger scale. It mimics mountains, lakes and fields and represents the life journey of the owner. As a variation, you may replace the wooden deck with a gazebo or pergola . The shelter will provide greater enjoyment of the garden. 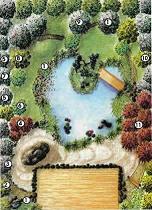 Instantly download this free Japanese Garden Plan now!